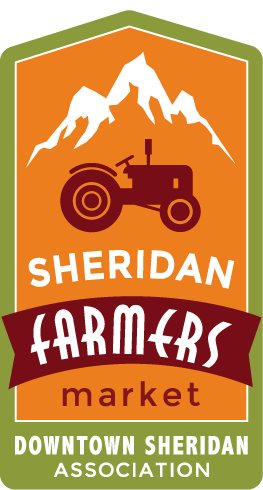 Sheridan Farmers Market updated their profile picture. Sheridan Farmers Market updated their cover photo. Sheridan Farmers Market shared a post. Attention Wyoming growers! Did you know there's a PSA Grower Training next Friday, Oct. 26, in Cheyenne? Spots are going fast, so be sure to register today! 15 Markets & 14 Thursdays, the Sheridan Farmers Market season was a success! It went by so fast! -Devoted customers who without we would have no market. I mean really, it is all about you. -Wonderful vendors for working countless hours to bring us healthy, locally grown produce, meats, eggs, among other products. -Chefs, bakers, cheese makers, knife sharpeners, and artisanal vendors for surprising us every Thursday with the beauty of your talents. -Musicians who entertained us with great hits and a festive atmosphere. I want to thank all the volunteers of the Sheridan Farmers Market. A special shout out to: Clarke McClung, John Buyok, Janet Hoxie, Cheryl Van Dyke, Robert Van Dyke, John Smith, Robby Smith, Krys Park, Carlos Pacheco, Tiffani Swenson, the Mowry Family and the Kessner Family. They worked behind the scenes to support our market through: planning, pouring beer, setting up and tearing down, etc. Thank you Emily Swinyer for facilitating Sheridan County 4-H's community service with the Market. We really appreciate you and your helpers. Thank you to the Sheridan Farmers Market’s Sponsors who made our programs possible: Knecht Home Center, Sheridan Ace Hardware/Ben Franklin, Bruce Burns, First Federal Bank & Trust, Luminous Brewhouse, Sheridan Media, Cato Ranch, Sheridan County 4-H, C & B Operations - Sheridan, Freshstart Landscape And Garden Services L.L.C, Sackett's Market, Heartland Kubota LLC, Sheridan Farmers Co-op, Verdello, Cottonwood Kitchen + Home, Greenhouse Living of Sheridan, Landon's Greenhouse, Nursery & Landscaping, and Ag @ Sheridan College. We’d also like to recognize the City of Sheridan WY - Government for their ongoing support. Thank you to the Downtown Sheridan Association staff, Mikkayla DeBolt and Zoila Perry. I appreciate all your help this season and your commitment to making our shoppers and vendors feel welcome. Thank you to Landon's Greenhouse, Nursery & Landscaping for partnering with us for the Local Markets Fall Festival as well. Thank you for all the hard work, I love the market and look forward to it every year. Sheridan Farmers Market added 45 new photos.